Today I tried my new Essentials of French Cooking by William Sonoma cook book. I started by leafing through page by page and managed to make it to page 56 before I decided I needed to get cooking. Surprisingly, I had everything needed for this recipe in my kitchen. How great and how unexpected for me. 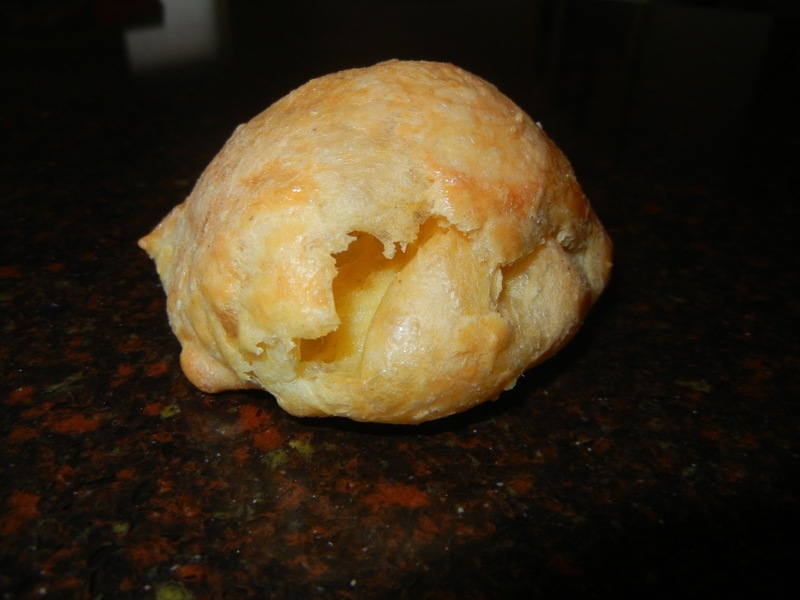 I decided to try a Gruyere Gougeres. 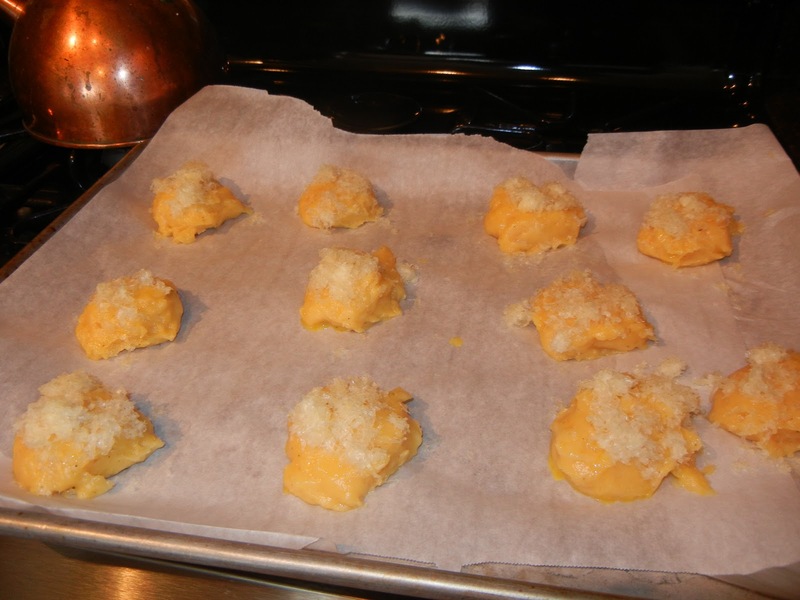 This hors d’ouvre is from the Burgundy Region (yes…this info came from my cookbook, how cool, eh?). 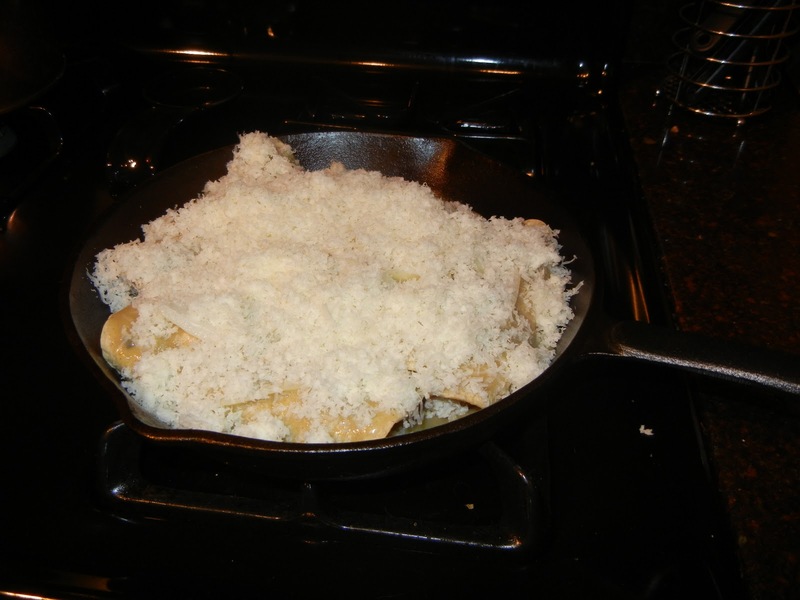 This is a very simple recipe that consists of butter, salt pepper, flour, egg and Gruyere. Sound familiar? Yes, it’s kind of a like a BLT Popover. It’s a whole hell of a lot easier to make than a BLT Popover, but I must say not nearly as tasty. How could this recipe have been better? It needs more cheese and a little more cheese. Would I make this recipe again? Probably not, but I would definitely make the BLT Popover again. I must admit the first Gorgeres was lackluster, but the second one, after it cooled a bit was more tasty. Again, it’s unlikely I will be making this recipe again. Have you ever made this recipe before? Have you used a William Sonomoa cookbook before? Are the recipes better than this first one I’ve made? We all get to a point in our lives where we are hard to buy gifts for. If I want/need something, I’ll go buy it. Finding a gift for me can be difficult. I received several gifts this year, but two, my favorite two, were gifts that made me immediately stop the momentum of gift opening — I wasn’t concerned what was in the next box, I wanted to dig deeper into this gift. These were both books — the first was from my mother. The book was Food Journeys of a Lifetime: 500 Extraordinary Places to Eat Around the Globe, by National Geographic. I slowly leafed through the 320 pages looking at the beautiful pictures and planning my next 200 vacations. I first looked for locations/adventures/meals I’ve already checked off my list — most of the ones I had checked off were from the past 2 years (thanks MS). I then looked at options in Vietnam to help beef up our upcoming trip. Very exciting. This is a large coffee table book, that, well, if I had a coffee table, would probably live for years to come. If you want some Nat Geo Food Journey advice for an upcoming trip, let me know and I’ll do some research for you. I love to help people plan for their vacations. Highly recommend this book — go buy it (following the above link will not give me a commission from Amazon, or anything like that). The second book was from MS. Much like the first book, this book caused the record to scratch and the gift exchanging process come to a complete halt. This book was The Essentials of French Cooking, by William Sonoma. I was never a big fan of French food — then we decided to go to Paris this past fall. From that point on — all bets were off. Everything from escargot to lamb chops to cheese for dessert I love it. The books William Sonoma have such great photos and just really make you want to jump in and cook away. The book starts with a map of France and information on each of their Regions and what they are known for. This book also outlines ideally what style of wine you’d serve with various dishes — while I’m not a purist or traditionalists in this regard, I do find it interesting. The book is very thorough and starts with hors d’oeuvres continues through desserts. The end of the book has Basic French recipes like Stocks and Croissant dough. How great. I’ve already made one recipe (this morning) and am working on a second now. See full reviews in the coming days. What was your favorite gift for Christmas? Do you find it hard to shop for people, as they “have everything”. Do you find that people can’t shop for you and you get stuck with things like a DVD full of actors that you hate? 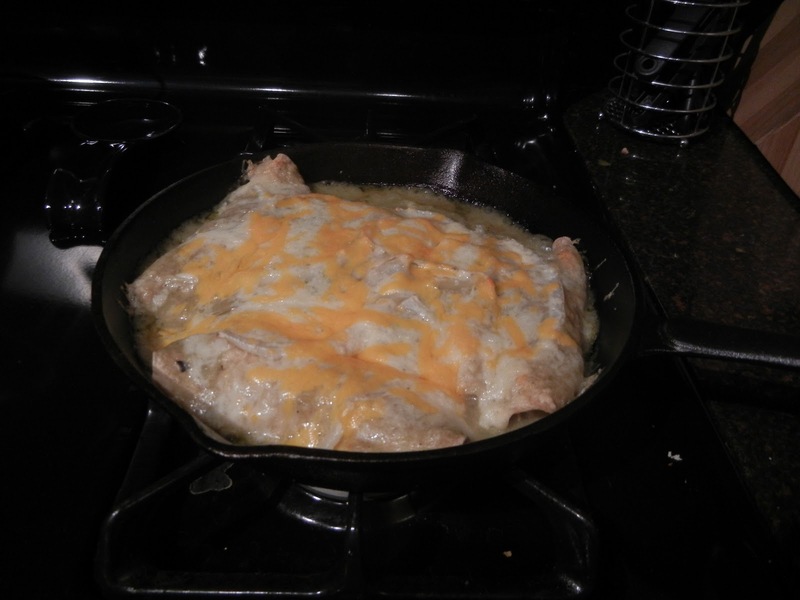 I’m still working my way through the Christmas Turkey leftovers — and last night I fixed Turkey Enchiladas Verde. This was a very simple yet, extremely tasty recipe. My first stop was the grocery store to pick up corn tortillas (don’t use flour — they just aren’t as flavorful as corn — why waste flavor), poblano peppers canned salsa verde, white onions and manchego cheese. 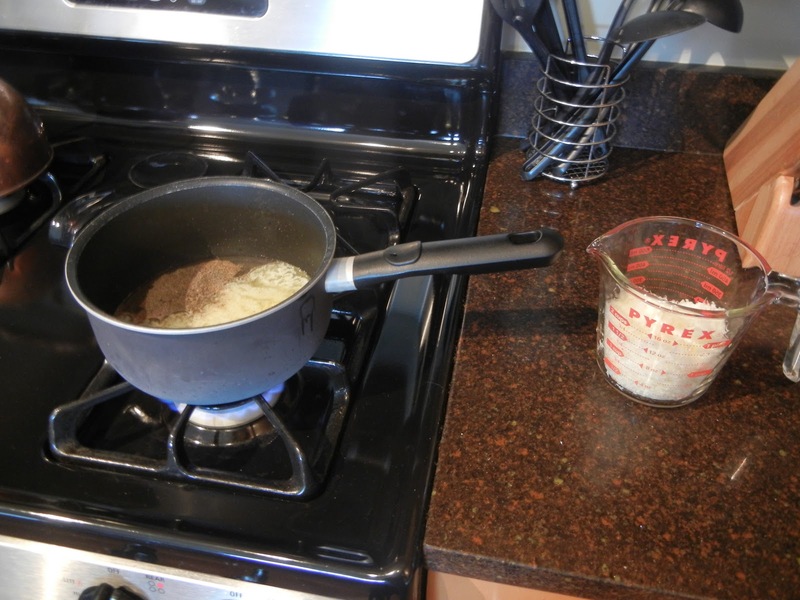 I know this isn’t a wild and crazy recipe and it’s a pretty vanilla American half recipe (I’m not making the sauce or the tortillas, but I am combining these simple components into a nice tasty meal). Unfortunately, poblanos were no where to be found. Strike that. Next step, soak a towel in water, wring so it is only damp and put the tortillas inside the towel. Put the towel/tortillas in the microwave for 2 minutes, so they are fully warm and softened. I would traditionally roll the shredded turkey (or chicken if I didn’t have left overs) with the poblano peppers in the tortillas and put them in an over safe pan with a small amount of sauce covering the bottom of the pan. 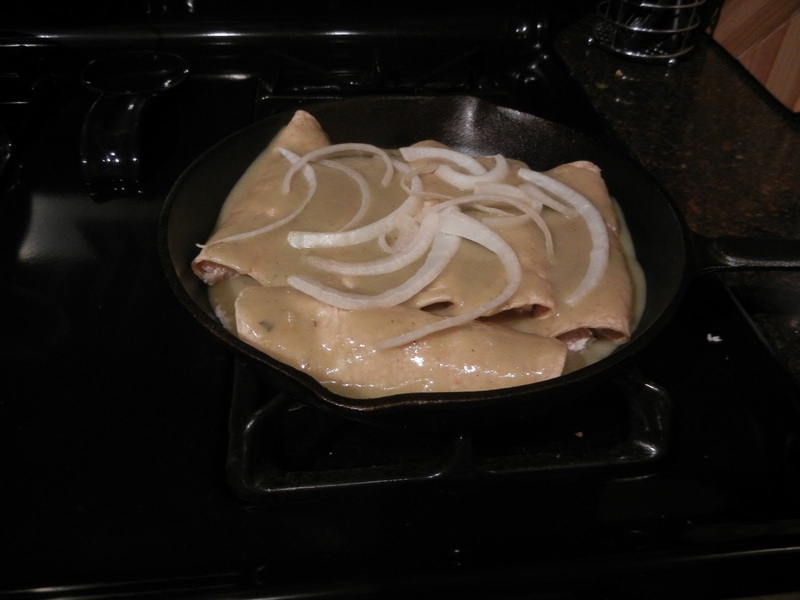 Continue to roll the turkey inside the tortillas until the pan is full. Make sure the tortillas are all rolled the same way (don’t have the “flap” on the bottom of one, the top of another, to the right on the first and the left on the second — it will make removing the enchiladas from the pan a total mess, trust me). Once the pan is full of the rolled tortillas, cover them with the rest of the canned salsa. The tortillas should be fully covered but not so much that they will be super saturated and soggy. Top with slices of half an onion. Now, shred the manchego cheese and sprinkler all over the tortilla and sauce in the pan. I decided to throw on some sharp cheddar to add some color and a bit more of a distinct flavor. The pan goes into a pre-heated over at 400 degrees and bake until the cheese is melted and golden brown (about 15-20 minutes). Serve hot. Again, this isn’t going to be an award winning recipe — but it is quite tasty and really easy to make. Next time I’ll provide some a better recipe…but trust me, this is quite nice. I scanned a few website trying to find the best recipes for left over turkey and honestly, I didn’t really find anything that jumped out at me. 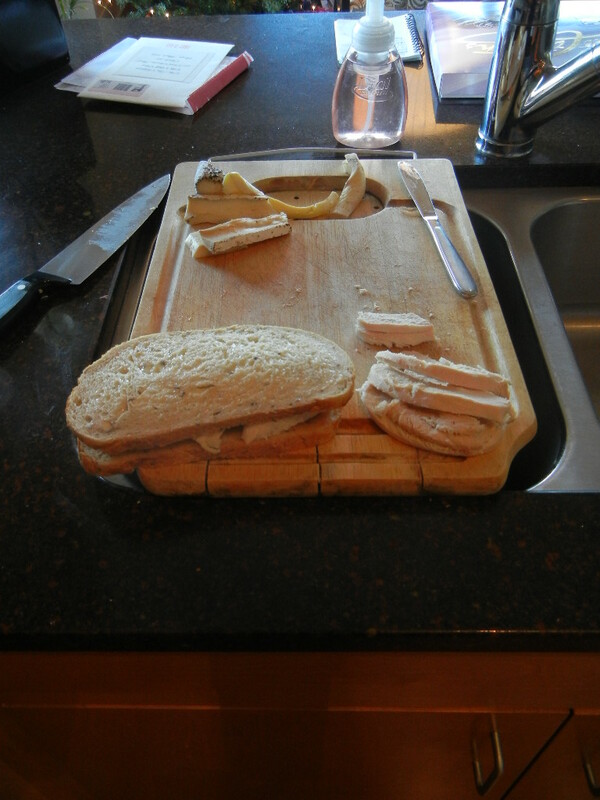 So I decided to mimic a a sandwich that I’ve seen on dozens of menus and have tried a handful of times: Turkey and Brie. I decided to couple it with apple butter and arugula and toast it. First stop: the grocery store. Found the brie, the arugula and a nice rye bread without issue. Finding the apple butter was not as easy. I looked near the jams/jellies and peanut butter, near the applesauce and near the ethnic foods. Nothing. I asked the lady at the Jewel and she had never heard of apple butter. No point in looking. Next step: Google alternatives. I found a couple websites that said you could you just microwave some all natural applesauce with some extra cinnamon for 5 minutes and it will reduce to an equivalent consistency. Ok, I’ll give that a go. I return home, put three individual servings of applesauce in a microwave safe dish with some cinnamon and zap it for 5 minutes. 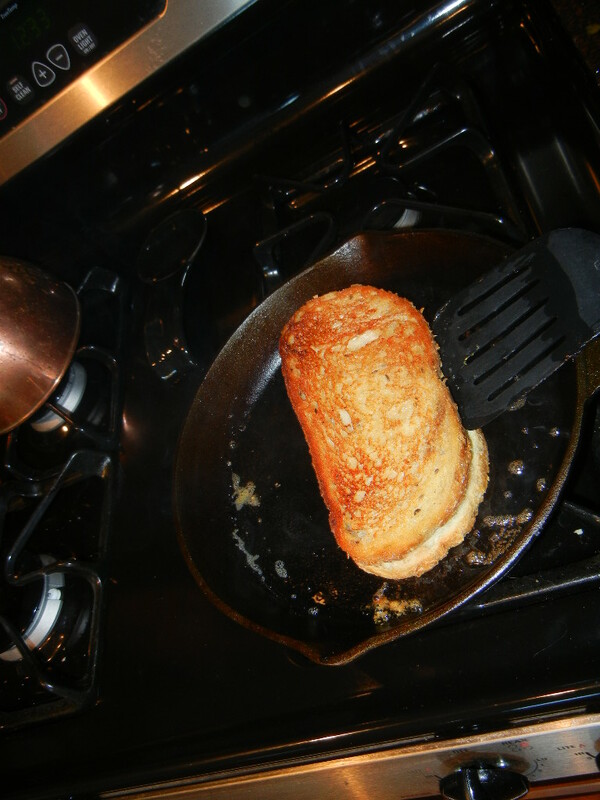 While we’re making “apple butter”, I slather some real butter on one side of the sandwich slices (the outside-that will brown against the pan). I cut some slices of last nights turkey and slice up a wedge of brie. I want the turkey to cover every square centimeter of the bread and the brie to do the same with the turkey. Once the “apple butter” is done, I taste it — and it’s pretty good. Not real apple butter, but reduced and flavorful. 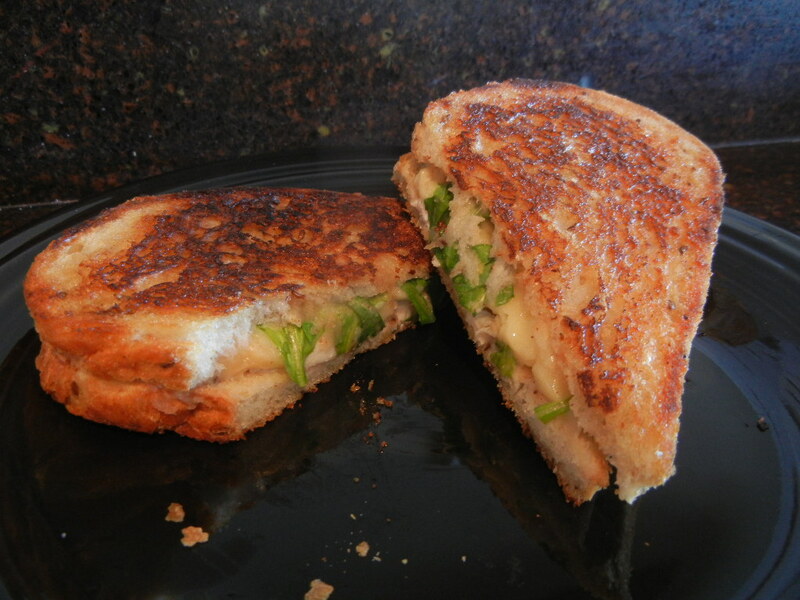 I spread the apple butter on the inside of the bread and layer turkey, brie and arugula and top it with the final piece of apple buttered bread. 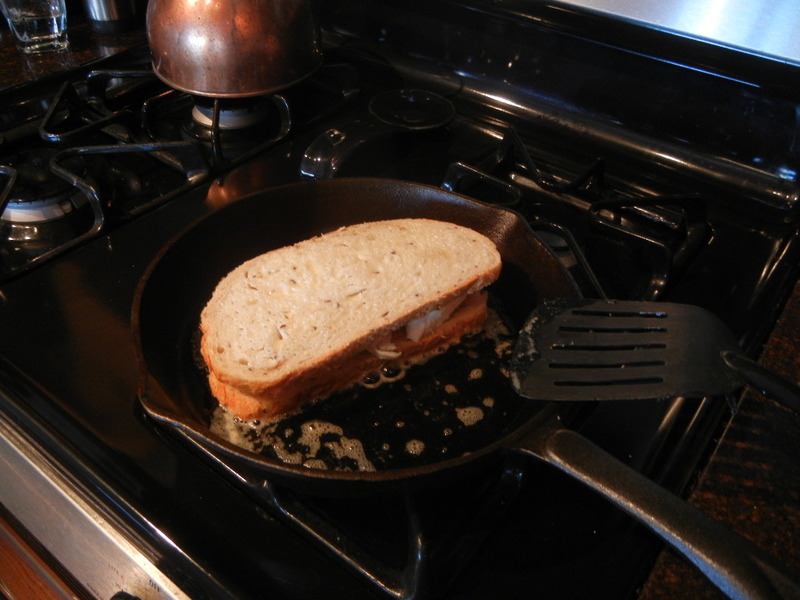 I put the sandwich in a heated and buttered cast iron skillet. I browned it on one side (medium heat) for 3 minutes then flipped it. I started with the brie side up. Then cooked the other side for about 4 minutes until the brie was melted. I followed this same plan for the second sandwich. I dished a bit of the “apple butter” onto the serving plates so we could have some more apple goodness at lunch. Quite a lovely and quick sandwich. It wasn’t all that healthy — with the butter and cheese, but it was tasty and it allowed me to use the turkey in a slightly different way. I would definitely use this recipe again. Did you have left overs from Christmas dinner that you are using now? Turkey? Ham? Beef? How are you using it? How long will you be eating leftovers? Any recommendations for me and my turkey? I moved into my home in April, 2009. You can read about that in my various blog entries that you can find on your own. 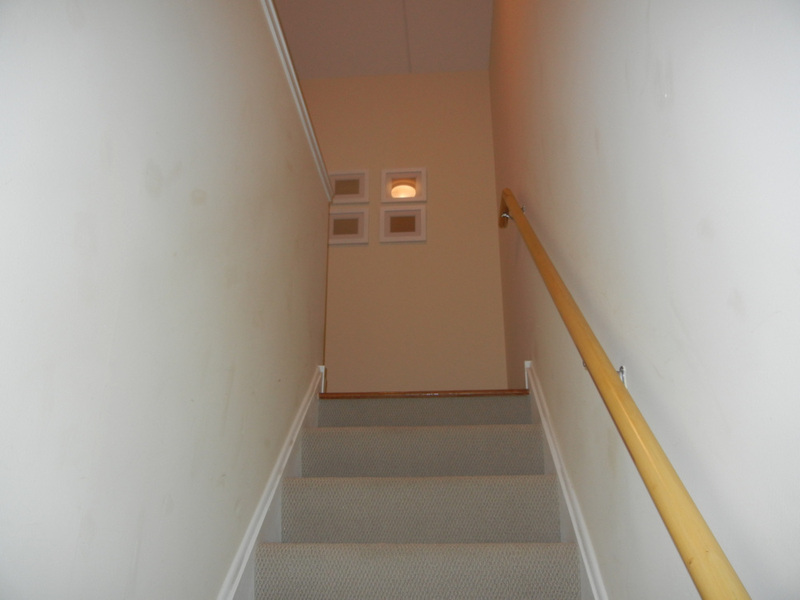 I told my mother that since I was giving her the upstairs and she could decorate as she saw fit (within reason). I just said I needed to have access to the guestroom — which needed to have a queen size bed and a dresser for guests — that’s it. I also needed to have access to a closet where Lilly’s box could be hidden away. Fast forward two and a half years later — nothing has been put up on the walls. I shouldn’t be surprised, as my parents really never put anything on the walls in any of the houses they lived in. Today I decided to rectify this. I’ve been slowly collecting frames when I see them on sale at Michael’s or another such store. I don’t necessarily know what will eventually fill these frames, but I know someday this frame will be a perfect home for something. I was inspired by an episode of Color Splash (HCLRS-907H), the one where he blended mid-century modernism with a Bollywood twist. There was a wall that was adorned with six very large white frames with large mattes and small (ish) photos. I cannot find a photo or a screen capture from the episode (and it wasn’t really a focal point of the show, more of a passing shot). I wanted to get 6 very large frame, that would take up most of the space on this wall — but MS talked me out of it. He said it might be too much white long the narrow wall. I listened. 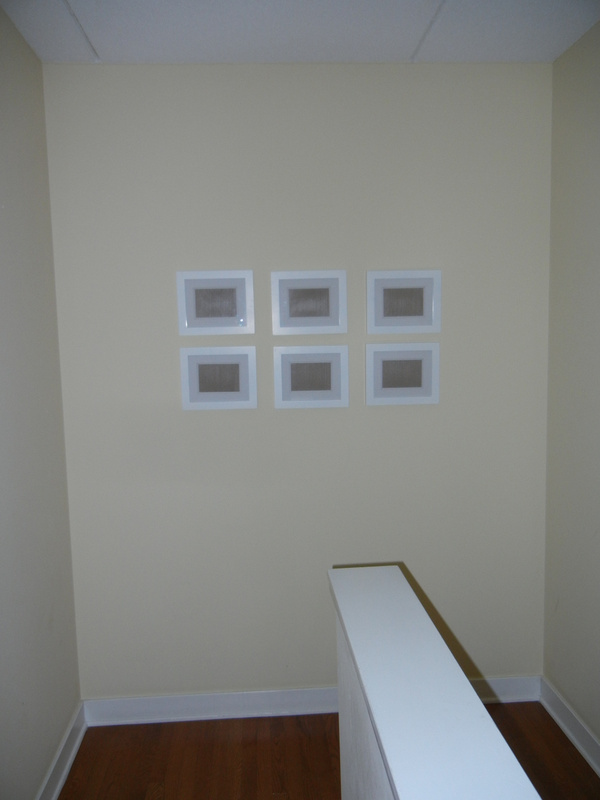 Instead I opted to purchase six smaller white frames with white mattes and arrange them in them horizontally 3 x 2 layout. I’m not 100% sold on the layout and I may switch it up to frames that take up the majority of this space, but haven’t made up my mind yet. The large frames would also hold larger pictures — perhaps as big as 8×10 photos — not just 5×7 prints. As you can see, these frames are not filled with pictures yet (I know, I know). 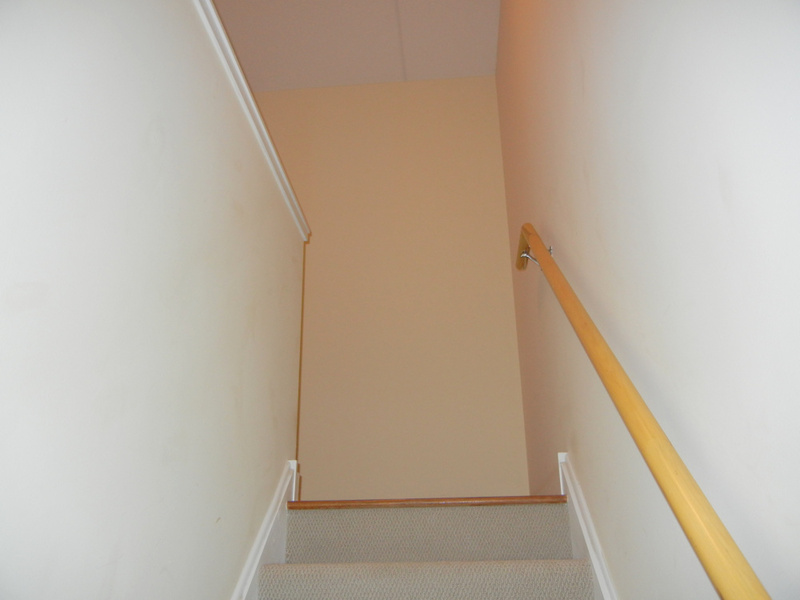 I am searching through my travel photos to find the perfect items to adorn my upper hallway. I am not going with the blank and white theme that I’ve used in the guest room, I’m going to push ahead with full color photos. What do you think? Are the three smaller frames dwarfed by the wall itself or do you think it flows well? 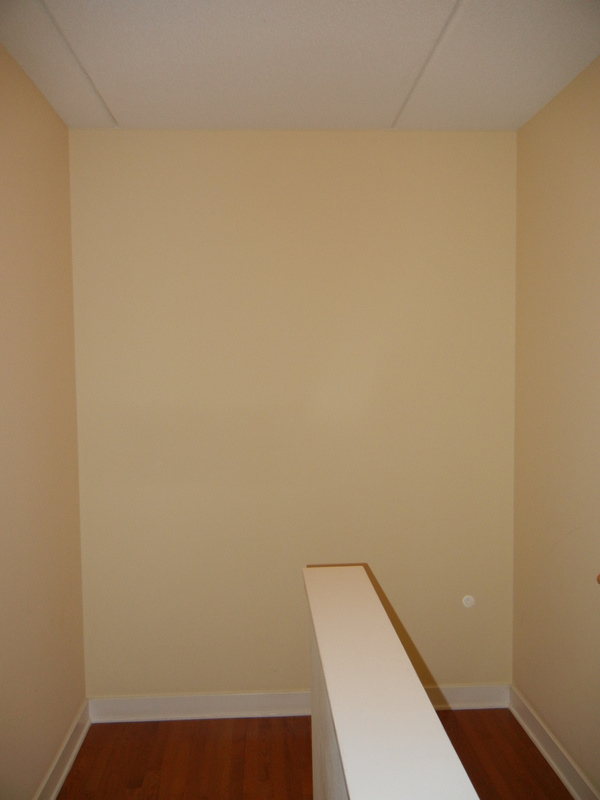 Would you prefer to see the large frames in this space? What else do I need to complete this area (besides actually putting photos in the frames, of course.